Wendy Shaw (Ph.D. University of Washington, B.A. Whitman College) is the Director for the Physical Sciences Division at Pacific Northwest National Laboratory. 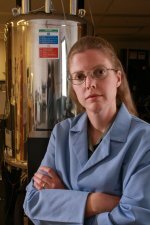 Her research focuses on learning from and mimicking nature at the intersection of chemistry and materials. Her projects are in two broad areas. These are developing a fundamental understanding the role of proteins in biomineralization processes and designing catalysts for renewable energy which mimic features of enzymes. Her funding comes through the National Institutes of Health (NIH) and the Department of Energy (DOE), including a DOE Early Career award. Dr. Shaw has published over 90 peer-reviewed papers and has an h-index of 34. She is a Kavli Fellow and serves on review panels for NIH and DOE. She also serves on the editorial board of Biophysical Journal, and has been an invited panelist for NIH, DOE, and the NRC. Catalysis: Gain a fundamental, molecular-level understanding of the role of the enzyme scaffold, or outer coordination sphere, on molecular catalysts. Investigating the role of proton channels, the environment around the active site, structural stability and dynamics on catalysts for H2 production and oxidation as well as CO2 hydrogenation. The long term goal of these projects is to implement the superior features of enzymes while maintaining the relative simplicity of a homogeneous catalyst. Biomineralization Processes: Investigation of biomineralization processes, particularly amelogenin, the protein which forms enamel using solid state NMR, neutron reflectivity and physical chemistry methods. Lercher J.A., A.M. Appel, T. Autrey, R.M. Bullock, D.M. Camaioni, H.M. Cho, and D.A. Dixon, et al. 2014. "Multifunctional Catalysts to Synthesize and Utilize Energy Carriers." In Frontiers at the Interface between Homogeneous and Heterogeneous Catalysis, II, 207-219. Washington, District Of Columbia:U.S. Department of Energy, Office of Science. PNNL-SA-103068. Pierce E.M., W.J. Shaw, C. Plata, and K.L. Manke. 2011. "Breaking Good." Radwaste Solutions 18, no. 1:42-46. PNNL-SA-76564. Neiner D., A.T. Luedtke, A.J. Karkamkar, W.J. Shaw, J. Wang, N. Browning, and T. Autrey, et al. 2010. "Decomposition Pathway of Ammonia Borane on the Surface of nano-BN." Journal of Physical Chemistry C 114, no. 32:13935-13941. PNNL-SA-72290. Tarasevich B.J., A.S. Lea, and W.J. Shaw. 2010. "The leucine rich amelogenin protein (LRAP) adsorbs as monomers or dimers onto surfaces." Journal of Structural Biology 169, no. 3:266-276. PNNL-SA-62449. Tarasevich B.J., A.S. Lea, W. Bernt, M.H. Engelhard, and W.J. Shaw. 2009. "Adsorption of Amelogenin onto Self-Assembled and Fluoroapatite Surfaces." Journal of Physical Chemistry B 113, no. 7:1833-1842. PNNL-SA-62448. Yang J.Y., R.M. Bullock, W.J. Shaw, B. Twamley, K. Fraze, K. Fraze, and M. Rakowski DuBois, et al. 2009. "Mechanistic Insights into Catalytic H2 Oxidation by Ni Complexes Containing a Diphosphine Ligand with a Positioned Amine Base." Journal of the American Chemical Society 131, no. 16:5935-5945. PNNL-SA-64310. Cho H.M., W.J. Shaw, V.M. Parvanov, G.K. Schenter, A.J. Karkamkar, N.J. Hess, and C.J. Mundy, et al. 2008. "Molecular Structure and Dynamics in the Low Temperature (Orthorhombic) Phase of NH3BH3." Journal of Physical Chemistry A 112, no. 18:4277-4283. PNNL-SA-58394. Shaw W.J., and K.F. Ferris. 2008. "Structure, Orientation and Dynamics of the C-Terminal Hexapeptide of LRAP Determined Using Solid State NMR." Journal of Physical Chemistry B 112, no. 51:16975-16981. PNNL-SA-61164. Tarasevich B.J., C.J. Howard, J.L. Larson, M.L. Snead, J. Simmer, M.L. Paine, and W.J. Shaw. 2007. "The Nucleation and growth of Calcium Phosphate by Amelogenin." Journal of Crystal Growth 304, no. 2:407-415. PNNL-SA-53267. Gutowska A., L. Li, Y. Shin, C.M. Wang, X.S. Li, J.C. Linehan, and R.S. Smith, et al. 2005. "Nano-Scaffold Mediates Hydrogen Release and Reactivity of Ammonia Borane." Angewandte Chemie International Edition 44, no. 23:3578-3582. PNNL-SA-43271. Shaw W.J., J.C. Linehan, A. Gutowska, D.J. Newell, T.E. Bitterwolf, J.L. Fulton, and Y. Chen, et al. 2005. "Synthesis and Characterization of a Recoverable Rhodium Catalyst with a Stimulus Sensitive Polymer Ligand." Inorganic Chemistry Communications 8, no. 10:894-896. PNNL-SA-45808. Drobny G.P., J.R. Long, T. Karlsson, W.J. Shaw, J.M. Popham, N. Oyler, and P.M. Bower, et al. 2004. "STRUCTURAL STUDIES OF BIOMATERIALS USING DOUBLE-QUANTUM SOLID-STATE NMR SPECTROSCOPY." In Annual Review of Physical Chemistry. 531-571. Palo Alto, California:Annual Reviews. PNNL-SA-41140. Franz J.A., W.J. Shaw, C.N. Lamb, T. Autrey, D.S. Kolwaite, D.M. Camaioni, and M.S. Alnajjar. 2004. "Absolute Rate Constants for Reactions of Tributylstannyl Radicals with Bromoalkanes, Episulfides, and alpha-Halomethyl-Episulfides, -Cyclopropanes, and -Oxiranes: New Rate Expressions for Sulfur and Bromine Atom Abstraction." Journal of Organic Chemistry 69, no. 4:1020-1027. PNNL-SA-41000. Pierce E.M., B.P. McGrail, E.A. Rodriguez, H.T. Schaef, P. Saripalli, R.J. Serne, and K.M. Krupka, et al. 2004. Waste Form Release Data Package for the 2005 Integrated Disposal Facility Performance Assessment. PNNL-14805. Richland, WA: Pacific Northwest National Laboratory. Shaw W.J., P. Kandandarachchi, J.A. Franz, and T. Autrey. 2004. "Spectroscopic Studies of Tributylstannyl Radical. Rates of Formation, Termination and Abstraction Determined by Transient Absorption Spectroscopy." Organometallics 23, no. 9:2080-2086. PNNL-SA-40565. Stayton P.S., G.P. Drobny, W.J. Shaw, J.R. Long, and M.R. Gilbert. 2003. "Molecular Recognition at the Protein-Hydroxyapatite Interface." Critical Reviews in Oral Biology And Medicine 14, no. 5:370-376. PNWD-SA-6692. Wang W., J.J. Han, L.Q. Wang, L. li, W.J. Shaw, and A.D. Li. 2003. "Dynamic pi-pi stacked molecular assemblies emit from green to red colors." Nano Letters 3, no. 4:455-458. PNNL-SA-38944. Birnbaum J.C., B.J. Busche, Y. Lin, W.J. Shaw, and G.E. Fryxell. 2002. "Synthesis of Carbamoylphosphonate Silanes for the Selective Sequestration of Actinides." Chemical Communications 13. PNNL-SA-36185. Drobny G.P., J.R. Long, W.J. Shaw, M.L. Cotten, and P.S. Stayton. 2002. "Structure and Dynamics of Proteins Adsorbed to Biomaterial Interfaces." In Encyclopedia of Nuclear Magnetic Resonance, edited by David M Grant & Robin K Harris. 458-468. New York, New York:Wiley. PNWD-SA-6693. Hoitink D.J., K.W. Burk, J.V. Ramsdell, and W.J. Shaw. 2002. Hanford Site Climatological Data Summary 2001 with Historical Data. PNNL-13859. Richland, WA: Pacific Northwest National Laboratory. Long J., W.J. Shaw, P. Stayton, and G. Drobny. 2001. "Structure and Dynamics of Hydrated Statherin on Hydroxyapatite As Determined by Solid-State NMR." Biochemistry 40, no. 51:15451-15455. PNWD-SA-5638. Shaw W.J., J.R. Long, A.A. Campbell, P.S. Stayton, P.S. Stayton, and G.P. Drobny. 2000. "A Solid State NMR Study of Dynamics in a Hydrated Salivary Peptide Adsorbed to Hydroxyapatite." Journal of the American Chemical Society 122, no. 29:7118-7119. PNWD-SA-5109. Shaw W.J., J.R. Long, J.L. Dindot, A.A. Campbell, P.S. Stayton, P.S. Stayton, and G.P. Drobny. 2000. "Determination of Statherin N-Terminal Peptide Conformation on Hydroxyapatite Crystals." Journal of the American Chemical Society 122, no. 8:1709-1716. PNWD-SA-5057.